The School of the Arts unveiled plans for the renovation of Buchanan Hall, home of the Division of Music. For 61 years, Buchanan Hall has served as the home of the Division of Music and helped prepare generations of students to shape the world. Originally named in honor of John H. Buchanan, a trustee and pastor of Birmingham’s Southside Baptist Church in 1960., the facility has served students and faculty well. Now, Samford’s School of the Arts begins a new chapter in its history with Buchanan Hall’s renovation. The project re-imagines the space, providing areas for growth and, most importantly, access for all students and faculty members. Davis Architects, a firm that has guided Samford’s campus design for decades, has created plans to transform the interior of the building to meet the needs of students and prepare for the future. 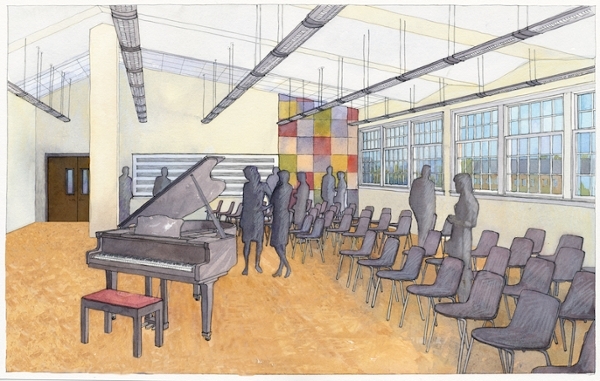 A complete renovation will begin in May 2019 and provide a state-of-the-art building with modern administrative offices, new HVAC systems, an elevator, student common areas, modern furnishings, practice studios, a vocal arts suite, sophisticated technology resources and a new inventory of pianos. Most importantly, the updates will ensure accessibility to all students regardless of their physical circumstances. From technology-efficient classrooms and labs to better-quality practice rooms and studios, Buchanan will become a space that represents the quality and high standards of the School of the Arts and its music program. As part of the project, 32 new pianos will be purchased to ensure the students are practicing on the best possible instruments. The new vocal arts suite will be the first designated choral suite in the school’s history and will provide the space to engage these talented students. With new safety features and an elevator, Buchanan will be an accessible and safe environment for visitors, students and faculty members. For more information on how to support the Buchanan Hall renovation, contact Julie Boyd at jboyd10@samford.edu.